Most were not recipes. When I looked at Mississippi I found over 123,000. So tender and it just falls apart in your mouth. It looks really weird, but hey, it works! 1 Spray your slow cooker with nonstick spray. 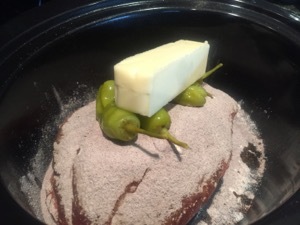 2 Place roast in the slow cooker and sprinkle with a little black pepper and a little seasoned salt. 3 Sprinkle the top with the ranch dressing mix and the au jus mix. 4 Place peppers on top of mixes. 5 Add the stick of butter on top. 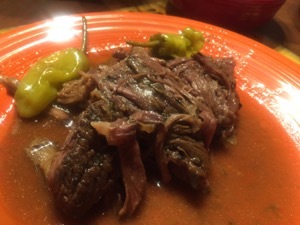 6 Set your slow cooker to 8 hours and forget it. 7 You do not add any additional water to this. 8 Served with mashed potatoes, but you could serve with egg noodles. ← No Chipotle at Chipotle? I’ve been working on my own version of this recipe. 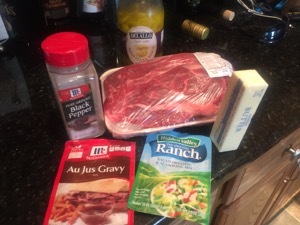 Almost all call for the mix-packs of ranch and au jus, but as I never have those around, I have a from-scratch version. This is a great dish, and versatile, too. 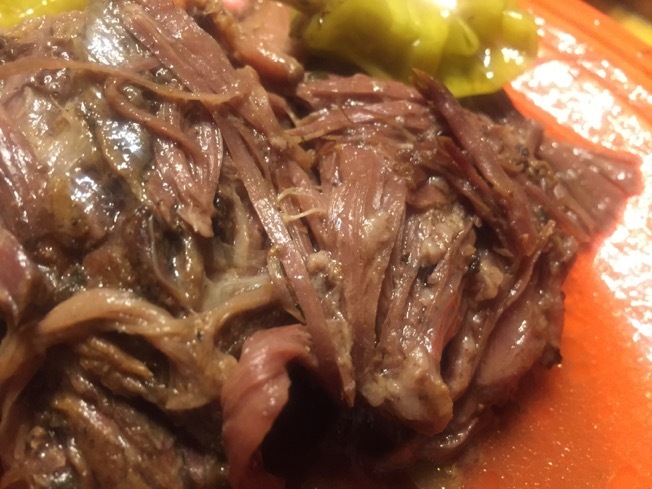 I’ve used the meat in everything from omelettes to sandwiches to nachos (ohhhh is it good in nachos!). I brought a pot of it to our latest “game night” with little slider buns and it was gone in about an hour.